To demonstrate how an ultrasound works, imagine this tennis ball as an internal organ in the body. Like many organs, the tennis ball is solid on the outside and hollow on the inside. Solid structures, such as bones and muscles, reflect sound waves from the ultrasound transducer and show up as white in an ultrasound image. Soft or hollow areas, like chambers of the heart, do not reflect sound waves and appear as black. 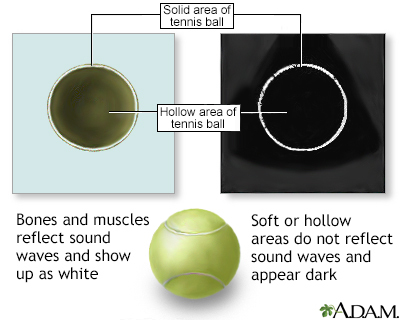 The white ring is the outer edge of the tennis ball being reflected back as an image while the center hollow area remains as black.